This is a real classic from the Italian kitchen: stuffed pasta in broth. The sixteenth century recipe prescribes the use of meat broth. If you replace this by a good vegetable broth, the result is a very tasty vegetarian dish. It is best not to serve the pasta in the broth in which it was cooked, but in seperately warmed broth of good quality. The recipe is taken from the magnificent book of Bartolomeo Scappi, with the concise title: Opera (‘ Work’, editie Scully). This was first printed in 1570, and reprinted untill well into the seventeenth century. Scappi was the personal cook (il cuoco segreto) of pope Pius V (1566-1572). The years of his birth and death are unknown. 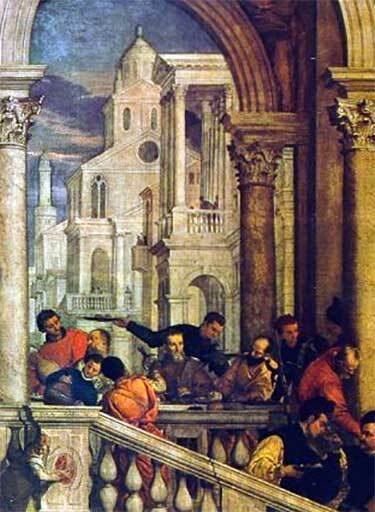 The first known fact in Scappi’s life is April 1536, when he organizes a banquet in honour of Charles V whilst in the service of cardinal Lorenzo Campeggi. He served several other cardinals after this, then moved on to popes: first pope Pius IV, later pope Pius V. In 1566 Scappi was responsible for planning a festive banquet to celebrate the first “birthday” of the pontificate of Pius V, but that feast was cancelled. Opera consists of six books. The first book is a dialogue between the master cook and his apprentice, in which the cook, his tasks, the organization of meals, all kinds of kitchenware, and the inspection and conservation of foodstuff are the subjects. The other five books contain information on and recipes for successively meat (cattle and game, and birds), fish-vegetables-eggs, a list of necessities a for cook travelling in the company of a prince and foodstuff according to season, recipes for sweet and savoury pies, and recipes for the sick. The book is famous for its many excellent illustrations, one of which you can see here. Whatever object related to cooking in the sixteenth century you can think of, Opera has an illustration of it: skimmers, knives, sugar graters, pots and pans, strainers, sieves, ladles, equipment for the hearth, anything and everything. 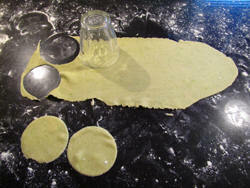 On the separate page for the pasta dough is a detail froman illustration in the Opera with a rolled-out sheet of dough. Henry Notaker discovered quite recently that part of Opera has been translated in Dutch in the seventeenth century in the Koockboec oft Familieren Keukenboec of M. Antonius Magirus (1612). (V. paper by Schildermans and Sels). More recipes from Scappi’s Opera on Coquinaria: Broccoli in the Opera, Macaroni from Scappi, Fava beans with saffron and herbs, White Tourte. The original recipe, taken from La gastronomie à la Renaissance. 100 recettes de France et d’Italie, edited by F. Sabban and S. Serventi, pp.102/104. An English translation was published in 2008 by T. Scully (see the recipe for Broccoli in the Opera). However, I kept my own translation from 2004. I have translated tortelli with tortellini. My father’s Italian neighbour told me that in modern Italian, tortelli are a kind of dough-nut balls that are eaten at Christmas and carnival. However, my Italian/Dutch dictionary defines tortelli as a ring of dough stuffed with vegetables and meat.Het oorspronkelijke recept, overgenomen uit La gastronomie à la Renaissance pp.102/104. Hoewel er in 2008 een prachtige nieuwe editie is verschenen van Terence Scully (Zie het recept voor Broccoli in de Opera), heb ik hier de tekstbron niet veranderd. Ook de in 2015 verschenen Nederlandse vertaling van Ike Scialona (zie bibliografie) heb ik niet gebruikt. Tortelli heb ik vertaald met tortellini. De Italiaanse buurvrouw van mijn vader wees mij erop dat tortelli in modern Italiaans een soort oliebollen zijn die tijdens kerstmis en carnaval worden gebakken. Dit is afwijkend van het Handwoordenboek Italaans/Nederlands van Van Dale, dat tortelli definieert als deegring gevuld met o.a. groente en vlees. Piglinosi biete, & spinaci, taglinosi minute, & lavinosi in piu acque, & strucchi fuori l’acqua, faccianosi soffriggere con butiro fresco, & con esse ponasi a bollire una brancata d’herbe odorifere, & cavinosi, & ponganosi in un vaso di terra oo di rame stagnato, & giungavisi cascio Parmeggiano grattato, & cascio grasso, tanto dell’uno quanto dell’altro, & pepe, cannella, garofani, zafferano, uva passa, & uove crude abastanza; & se la compositione fosse troppo liquida pongavisi pan grattato, ma se sarà troppo soda, metavisi un poco piu di butiro, & habbiasi un sfoglio di pasta fatta nel modo che se dice nel capitolo 177. E faccianosi i tortelli piccoli, & grandi, facendoli cuocere in buon brodo di carne, & servanosi con cascio,. zuccaro, & cannella sopra. Take greens of beets and spinach, chop very finely. Rinse it several times in water, and press the water out. Then braise [the greens] in fresh butter, and let them cook with a handful of aromatic herbs. 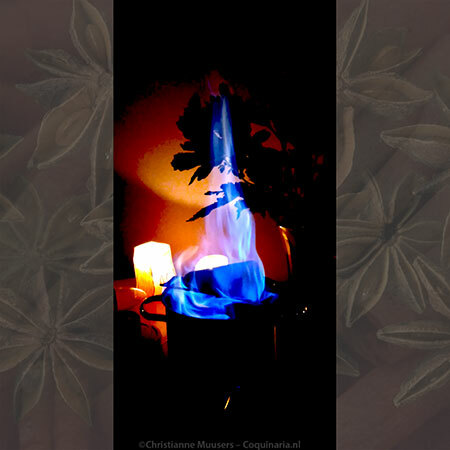 Take them off the fire and put them in an earthenware pot or a pot of tinned copper. Add grated Parmesan cheese, and fresh cheese, in equal measure, and pepper, cinnamon, cloves, saffron, raisins and enough raw eggs. If the mixture is too runny, add some bread crumbs. But if it is too dry, add some more butter. Take a sheet of dough made in the manner as told in chapter 177. Make small or large tortellini and let them cook in good meat broth. 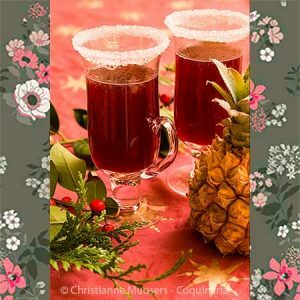 Serve with cheese, sugar and cinnamon on top of it. For the picture of this recipe I made square pasta, ravioli. To be perfectly honest: when I prepared this dish I was in a hurry (the semi finals of the 2004 EC football was to start in half an hour!). For tortellini you use exactly the same stuffing and pasta dough. The only difference is the amount of time needed to make them. For 2 to 6 persons, depending on the ratio pasta/broth. You can serve this dish as a clear soup with a few tortellini floating in it, but also as a dish with stuffed pasta over which a little broth is poured. Preparation in advance45 minutes + 1 hour drying of the stuffed pasta; preparation3 minutes. First prepare the stuffing – Rinse the vegetables well. Chop them small and braise them in butter until they have lost their excess water. Add the herbs shortle before removing the pan from the fire. Drain the vegetables well, squeeze them gently to get them as dry as possible. Add the other ingredients for the stuffing to the greens (saffron with milk and all). Then prepare the pasta dough – While the greens are cooling off, you can prepare the dough. See the basic recipe or the recipe for pasta dough from the sixteenth century. Do not forget to add milk to the dough, because you are making stuffed pasta. The milk will ensure a good sealing of the dough. Also: mind that you have to make the ravioli or tortellini at once after rolling out a sheet, also to ensure that the stuffed pasta is sealed. If you let the sheets dry (as you have to do when you are making tagliatelle and the likes), the pasta will not seal properly. 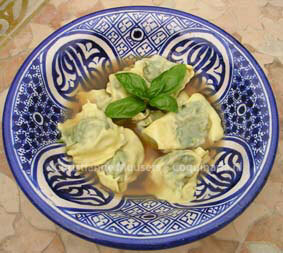 Make tortellini – Sprinkle the worktop with flour, spread the freshly rolled sheet of pastra dough on it. Cut rounds out of a pasta sheet with a glass. Heap a teaspoon of stuffing on each round, and fold them in half. Take the edges and press these together. You can also turn the edges downward before pressing together. You can also cut squares and fold the4se diagonally, that way there’s less waste. Arrange the tortellini next to each other on a towel. Let dry at least half an hour before cooking. Here is a picture of folding tortellini. Or make ravioli – This is much quicker. Heap little spoonfulls stuffing on one half of the sheet. Moisten the edges and the spaces between the heaps with a finger dipped in water. Fold the sheet double, and press gently between the stuffing. Cut the ravioli with a pasta cutter or a knife, and lay the stuffed pasta on a clean, dry kitchen towel. Take care that the ravioli do not touch each other. Let dry at least half an hour before cooking. Heat the stock – The stock in which you want to serve the pasta is heated at the same time as the stock for cooking the pasta, because fresh tortellini only take a few minutes to cook, and need to be served as soon as possible. Cook the pasta – Bring water to the boil in a pasta pan, add stock cubes (chicken, meat, vegetable, mushroom). As soon as the water boils, add pasta. It takes only a few minutes, and it is very easy to see when the pasta is ready, it will float to the surface. As soon as all tortellini or ravioli have surfaced, the pasta is done. Lift the perforated insert out, drain the pasta, and divide over preheated deep soup plates or bowls. Spoon stock over the pasta, and serve. How much stock depends on whether you want to serve soup with pasta, or pasta with a little soup. Serve the pasta at once. Serve with it in separate bowls some Parmesan cheese and some sugar mixed with cinnamon powder. Literally this means re-cooked, or twice cooked. Sometimes it is compared to cottage cheese, but the production is very different. To separate the curd (from which cheese is made) from the whey, milk is heated. Whey, normally a leftover product (that is loved by pigs, by the way, see picture on my cheese page), is reheated to make ricotta. Rennet is added to the whey, or another coagulant. The result is a moist, crumbly cheese. F. Sabban and S. Serventi, La gastronomie à la Renaissance, 100 recettes de France et d’Italie (Beaux Livres) , Éd. Stock, 1997. (No English translation). Bartolomeo Scappi, Opera dell’arte del cucinare. Edition Arnaldo Forni, 2002 (facsimile-edition, two vols.). J. Schildermans en H. Sels, “A Dutch translation of Bartolomeo Scappi’s Opera” In: Petits Propos Culinaires 74 (december 2003) pp.59/70.